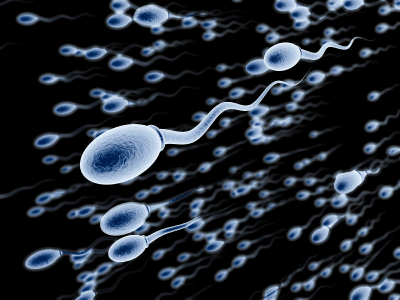 It has not been easy to steer pluripotent cells toward making sperm in vitro. Learning how sperm precursors develop in vivo allowed a group led by Mitinori Saitou at RIKEN in Kobe, Japan, to derive embryonic primordial germ cells from embryonic cells in culture and use them to restore fertility in sterile mice1. The work suggests that the secret to making some differentiation programs work may lie in shielding precursor cells from inhibitory signals generated within heterogenous cell cultures. Primordial germ cells (PGCs) originate from a small subset of embryonic epiblast cells, and gene knockout studies had demonstrated the need for two bone morphogenetic proteins (BMP4 and BMP8b) in this process. However, nobody knew why BMP signals induced PGC formation in only a subset of epiblasts. To figure that out, Saitou's team used a combination of in vivo genetic manipulations as well as a culture of whole and partially dissected mouse embryos. They found that within the embryo, BMP4 can instruct a small subset of competent epiblast cells to become PGCs because BMP8b limits the development of surrounding embryonic tissue that emits inhibitory signals. Indeed, if the epiblast is isolated so that it is no longer in contact with neighbouring inhibitory tissue, BMP4 alone is sufficient to generate PGCs. And these PGCs proved to be functional; when injected into the testes of sterile mice they became sperm and gave rise to a healthy offspring. According to Saitou, the most unexpected and interesting finding was that BMP8b acts indirectly by keeping inhibitory signals in check. This led him to form an idea about why some cell types are so hard to generate from embryonic stem cell cultures: "pluripotent cells often differentiate into several lineages in culture, some of which may secrete inhibitory signals for the lineage you want to generate". So to obtain a cell of interest, he says, it may be necessary to generate a pure culture of precursors first. Saitou believes that it will be possible to make functional PGCs from stem cells in vitro, though he warns that it will be much harder to make sperm "because many things are unknown regarding how PGCs grow, differentiate and mature into sperm or oocytes". Niels Geijsen, who investigates germ cell differentiation at Harvard University in Cambridge, Massachusetts, emphasizes that several groups have already derived PGCs from stem cells in culture, but their differentiation into functional gametes was impaired by defects in meiosis. These failures, argues Geijsen, are due to a poor understanding of early PGC development. In this regard, the key to the Saitou team's success was identifying the correct microenvironment for the embryonic cells. "I have a feeling that this is an overall theme with differentiating stem cells in culture," he adds. "They get stuck; they give rise to embryonic tissue but have a hard time making a transition to normal adult cells."